Lord Durham's Appeal for Gear. 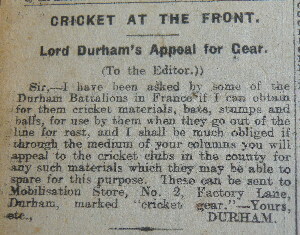 Sir, - I have been asked by some of the Durham Battalions in France, if I can obtain for them cricket materials, bats, stumps and balls, for use by them when they go out of the line for rest, and I shall be much obliged if through the medium of your columns you will appeal to the cricket clubs in the county for any such materials which they may be able to spare for this purpose. These can be sent to Mobilisation Store, No.2, Factory Lane, Durham, marked 'cricket gear'. Yours etc.